Background: The prevalence of obstructive sleep apnea (OSA) in subjects with cardiovascular illness is estimated to be 2 to 3 times upper than in the general population. Complex ventricular ectopies and non-sustained ventricular tachycardia’s during sleep occur more commonly in patients who have OSA. Aim: We aim to compare the ventricular therapies events recorded by the implantable cardiac defibrillator (ICD) in patients with mild and severe OSA. Methods: We selected 30 patients with controlled hypertension, with normal renal function, all of them having an ICD and OSA. The patients were separated into two groups: mild OSA (n=15) and severe OSA (n=15), in both patients, received continuous positive airway pressure (CPAP) treatment. All of them were followed during 6 months to assess the records from ICDs and AHI from polysomnography. Results: In the mild OSA group, 20% presented anti-tachycardia pacing (ATP) events, while in the severe OSA group 87% showed ATP events (P=0.0007). The relative risk (RR) of ATP events in severe OSA group is 4.57, with 95% Confidence Interval (95%CI) from 1.88 to 13.21 in comparison to mild OSA group. Regarding shock events, the mild OSA group registered 7% of shocks, and the severe OSA group recorded 47% of shock events (P=0.0352). The RR of shock events in severe OSA group is 5.09, with 95%CI from 1.25 to 28.89 in comparison to mild OSA group. Conclusions: Our data show that in patients with severe OSA, the risk of ventricular arrhythmias and therapies events are more usual than in patients with mild OSA. Obstructive sleep apnea (OSA) results when the lenient tissues around the upper airway collapse, obstructing air flow partly or completely, despite increased ventilator effort . The prevalence of sleep apnea in the general population is amazingly high, for it affects an estimated 15 million adult Americans . The prevalence of OSA in subjects with cardiovascular illness is estimated to be 2 to 3 times upper than in the general population . Unluckily, the degree of under-diagnosis of OSA—therefore of under-treatment—remains high, even in cardiac patients [3-6]. Both complex ventricular ectopy and non-sustained ventricular tachycardias during sleep occur more commonly in patients who have OSA . A long-term study of OSA patients shows that after a mean of 7 years, sudden cardiac death (SCD) is minus common in compliant CPAP patients than in noncompliant ones . Patients with untreated OSA appear to have greater morbidity and mortality proportions than do patients with treated OSA, and this outcome is in accord with the increased mortality rates associated with other diseases of the respiratory- pulmonary system [9,10]. A study of the diurnal period of SCD suggests that people with OSA are more likely to experience their sudden events during the night (from 12 am till 6 am) than are those without OSA, who are more probable to die in the well-recognized blanking between 6 am and 12 pm . Moreover, this study shows a direct connection between the severity of OSA, as measured by the apnea-hypopnea index (AHI), and the risk of SCD during the night period. Recent data suggest that this preference for nighttime events in patients with OSA can be elucidated, in part, by the larger number of nocturnal ischemic events that occur in these patients . Based on this, we aim to compare the ventricular therapies events recorded by the implantable cardiac defibrillator (ICD) in patients with mild and severe OSA. We selected 30 patients with controlled hypertension, with normal renal function, all of them having an ICD and OSA. The study was piloted in agreement with the Helsinki declaration and approved by the ethics committee of our institution. All patients signed the informed consent term before inclusion. This study was conducted at the Hospital e Clínica São Gonçalo, Rio de Janeiro, Brazil. Patients were recruited from January 2015 till January 2016 from the Arrhythmias and Artificial Cardiac Pacing Service of the same hospital. Patients with the combination of the following criteria were consecutively enrolled: (i) mean 24-hour systolic ambulatory blood pressure measurements (ABPM) of ≥100 and <130 mmHg, (ii) essential hypertension for >1 year, (ii) age between 18 and 70 years; (iii) ICD implantation for primary prophylaxis to SCD , without ischemia proved by cardiac magnetic resonance image (CMRI); (iv) mild or severe obstructive sleep apnea syndrome, defined as apnea/hypopnea index (AHI) between 5 and 15 or >30 events/hour, respectively; (v) glomerular filtration rate estimated by the Chronic Kidney Disease Epidemiology Collaboration (CKD-EPI equation, eGFR20 >60mL/min/1.73 m2 without microalbuminuria); and (vi) the capacity to read, comprehend, and sign the informed consent form and attend the clinical tests. The patients that presented any of the subsequent criteria were excluded: (i) pregnancy; (ii) valvular disease with significant adverse sequelae; (iii) unstable angina, myocardial infarction, transient ischemic attack or stroke within the 6 months before the procedure; (iv) renovascular abnormalities; (v) psychiatric disease; (vi) allergy to ionic contrast medium; (vii) the inability to be monitored clinically after the procedure; (viii) a known addiction to drugs or alcohol that affects the intellect; (ix) or a serious health condition that, in the investigator opinion’s, may adversely affect the safety and/or efficacy of the participant or the study. The patients were separated into two groups: mild OSA (n=15) and severe OSA (n=15), in both patients, received continuous positive airway pressure (CPAP) treatment. All of them were followed during 6 months to assess the records from ICDs and AHI from polysomnography. CMRI, 24-hour ABPM, and polysomnography were previously described [13-16]. The results are expressed as a mean and standard deviation for normally distributed data and as median with interquartile range otherwise. All statistical tests were two-sided. Comparisons between two-paired values were performed with the paired t-test in cases of a Gaussian distribution and by the Wilcoxon test otherwise. Comparisons between more than two-paired values were made by repeated-measures analysis of variance or by Kruskal–Wallis analysis of variance as appropriate, complemented by a post-hoc test. Categorical variables were compared with Fisher’s exact test. A P-value <0.05 was considered significant. Correlations between two variables were performed by Pearson’s chi-square test in case of a Gaussian distribution and with the Spearman correlation test otherwise. All statistical analyses were performed using the program Graphpad Prism v 7.0 (Graphpad Software, La Jolla, CA, USA). The general features of the 30 patients divided into two groups are listed in Table 1. By definition, even in CPAP use, the differences regarding AHI between groups are disposed of in Figure 1A. At baseline, the mild OSA group presented AHI of 8.6 ± 3.4 events/hour, and severe OSA group showed 45.6 ± 10.4 events/hour, reducing to 9.5 ± 4.2 events/hour and augmenting to 55.3 ± 6.8 events/hour, respectively (P=0.0014 for comparison into severe OSA group). The comparison at the 6th month of follow-up showed a significant difference between groups, ∆=45.8 events/hour (P<0.0001). Figure 1. Apnea/hypopnea index (AIH) at baseline and 6th month of follow-up. OSA, obstructive sleep apnea; Mild OSA group (n=15) and Severe OSA group (n=15). Values are presented as Mean ± SD. 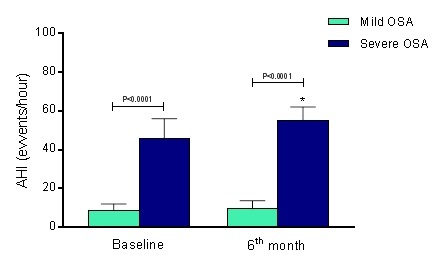 *P<0.0001 in the comparison between groups at the 6th month of follow-up. At baseline, the mild OSA group presented 3.3 ± 1.0 ATP events, and severe OSA group showed 15.4 ± 1.5 ATP events (P<0.0001), maintaining 4.5 ± 1.7 ATP events and augmenting to 28.8 ± 2.3 ATP events, respectively (P<0.0001 for comparison with severe OSA group). The comparison at the 6th month of follow-up presented a significant difference between groups, ∆=24.3 ATP events (P<0.0001), as shown in Figure 1B. Figure 2. 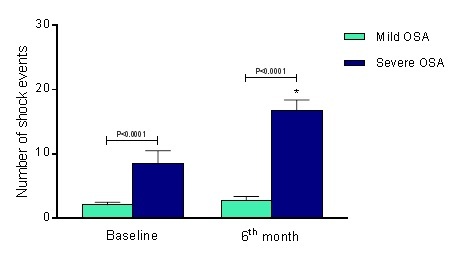 Anti-Tachycardia Pacing (ATP) events at baseline and 6th month of follow-up. OSA, obstructive sleep apnea; Mild OSA group (n=15) and Severe OSA group (n=15). Values are presented as Mean ± SD. *P<0.0001 in the comparison between groups at the 6th month of follow-up. The mild OSA group presented 2.1 ± 0.4 shock events, and severe OSA group showed 8.5 ± 2.0 shock events at baseline (P<0.0001), maintaining 2.8 ± 0.6 shock events and increasing to 16.8 ± 1.6 shock events, respectively (P<0.0001 for comparison with severe OSA group). The comparison at the 6th month of follow-up presented a significant difference between groups, ∆=14.0 shock events (P<0.0001), as shown in Figure 1C. Figure 3. Shock events at baseline and 6th month of follow-up. OSA, obstructive sleep apnea; Mild OSA group (n=15) and Severe OSA group (n=15). Values are presented as Mean ± SD. *P<0.0001 in the comparison between groups at the 6th month of follow-up. In the mild OSA group, 20% presented ATP events, while in the severe OSA group 87% showed ATP events (P=0.0007). The relative risk (RR) of ATP events in severe OSA group is 4.57, with 95% Confidence Interval (95%CI) from 1.88 to 13.21 in comparison to mild OSA group. Regarding shock events, the mild OSA group registered 7% of shocks, and the severe OSA group recorded 47% of shock events (P=0.0352). The RR of shock events in severe OSA group is 5.09, with 95%CI from 1.25 to 28.89 in comparison to mild OSA group. In the present study, we reported that the ATP and shock events recorded by the ICDs are higher in patients with severe OSA in comparison to mild OSA, thus avoiding the SCD. Furthermore, in the mild OSA group, 20% presented ATP events, while in the severe OSA group 87% showed ATP events, while the shock events registered in the mild OSA group was 7%, and in the severe OSA group 47%. In agreement with our results, we conjectured that OSA is related to an augmented hazard of SCD independently of extra risk factors and that the harshness of OSA is straight associated with the magnitude of this risk. A meticulous, multicenter study showed that for the period of sleep non-sustained ventricular tachycardia happened in 5.3% and complex ventricular ectopies arisen in 25% of patients with sleep-disordered breathing, which included OSA as well as central sleep apnea17. Subsequently, correction for comorbidities, the ones with sleep-disordered breathing presented a 3.4-fold risk of non-sustained ventricular tachycardia episodes and a 1.7-fold risk of complex ventricular activity in comparison to individuals that had a standard sleep. The only prior controlled longitudinal study evaluating the risk of SCD in subjects with OSA compared the rate of SCD after an average of 7.5 years in 107 OSA patients who were acquiescent with CPAP therapy and 61 OSA patients who had withdrawn therapy. SCD occurred in 4 patients (7%) with untreated OSA and in no patients (0%) with treated OSA . OSA events cause systemic hypoxemia, which is sometimes severe and extended. These continuous oxygen desaturations in OSA patients may cause premature ventricular contraction. Hypoxemia allied to hypercapnia also activates the chemoreflex, which upsurges vascular sympathetic nerve traffic and serum catecholamines. Tachycardia and outbreaks in blood pressure at the end of apneas outcome in amplified myocardial oxygen request at a time when oxygen saturation is at its deepest, a condition that may lead to myocardial ischemia and potentially dysrhythmic penalties. Subjects with OSA also have a paradoxical rise in coagulability through the night. Platelet activation and aggregation are augmented, fibrinogen levels are increased, and fibrinolytic activity is reduced throughout sleep in patients with OSA [19,20]. An enlarged danger of SCD in patients with OSA may also be clarified by heart autonomic dysfunction. The OSA affects mechanisms facilitating heart rate variability, comprising central nervous system combination between cardiac and ventilatory parasympathetic participations, the arterial baroreflex, and feedback from pulmonary stretch receptors . As a result, heart rate variability is decreased in patients with OSA . Moreover, the electrocardiographic QTc interval, which characterizes the duration of ventricular repolarization, and QTc interval dispersion, which reproduces the heterogeneity of repolarization, are atypical in patients with OSA. QTc interval dispersion correlates directly with the AHI and the length of nocturnal hypoxemia . 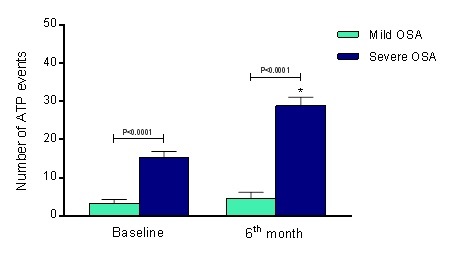 Additionally, the growth in sympathetic drive persists during the awake daytime period in subjects with OSA . Whereas the exact link between autonomic function and SCD remain mostly unidentified , chronic sympathetic overdrive has been identified as a risk marker for SCD . Also, OSA is existent in a large proportion of patients with heart failure and has been associated to chronic left ventricular dysfunction [27,28], therefore contributing to neurohumoral activation and myocardial remodeling that create the substrate for the SCD event. The mechanism of SCD is frequently well thought-out to be a ventricular arrhythmia. However, a number of other processes can simulator the unexpected and rapidly fatal presentation required by the definition of SCD. This may also result from other cardiovascular events, such as massive pulmonary embolism, subarachnoid hemorrhage, and aortic dissection. A different minus knew but the theoretically important root of sudden death in individuals with OSA is the apnea by itself. An obstructive apnea event may not lay off due to unsuccessful stimulation mechanisms related to decreased chemosensitivity, which leads to deep cerebral hypoxemia and death. Three such cases, with polysomnographic and electrocardiographic monitoring, have been reported previously [29,30]. Our data show that in patients with severe OSA, the risk of ventricular arrhythmias and therapies events are more usual than in patients with mild OSA. Eventhough encouraging, our data are preliminary and need long-term validation in a large population. This study was funded by Pacemed (US $100,000), Rio de Janeiro, Brazil. Somers VK, White DP, Amin R, Abraham WT, Costa F, Culebras A, et al. (2008) Sleep apnea and cardiovascular disease: An American Heart Association/American College of Cardiology Foundation Scientific Statement from the American Heart Association Council for High Blood Pressure Research Professional Education Committee, Council on Clinical Cardiology, Stroke Council, and Council on Cardiovascular Nursing. J Am Coll Cardiol 52: 686-717. Yumino D, Tsurumi Y, Takagi A, Suzuki K, Kasanuki H (2007) Impact of obstructive sleep apnea on clinical and angiographic outcomes following percutaneous coronary intervention in patients with the acute coronary syndrome. Am J Cardiol 99: 26-30. Mehra R, Benjamin EJ, Shahar E, Gottlieb DJ, Nawabit R, et al. (2006) Association of nocturnal arrhythmias with sleep-disordered breathing: The Sleep Heart Health Study. Am J Respir Crit Care Med 173: 910-6. Kiuchi MG, E Silva GR, Paz LM, Chen S, Souto GL (2016) Proof of concept study: renal sympathetic denervation for treatment of polymorphic premature ventricular complexes. J Interv Card Electrophysiol. Johns MW (1991) A new method for measuring daytime sleepiness: the Epworth sleepiness scale. Sleep 14: 540 –545. Rechtschaffen A, Kales A (1968) A Manual of Standardized Terminology, Technique and Scoring System from Sleep Stages of Human Subjects. Washington, DC: US Department of Health, Education, and Welfare Public Health Service–NIH/NIND. [No authors listed] (1999) Sleep-related breathing disorders in adults: recommendations for syndrome definition and measurement techniques in clinical research–the report of an American Academy of Sleep Medicine Task Force. Sleep 22: 667– 689. Gami AS, Somers VK (2007) Sleep apnea and cardiovascular disease. In: Zipes, DP., editor. Braunwald's Heart Disease: A Textbook of Cardiovascular Medicine. 8. Philadelphia: Saunders. Roche F, Xuong AN, Court-Fortune I, Costes F, Pichot V, et al. (2003) Duverney D, Vergnon JM, Gaspoz JM, Barthelemy JC. Relationship among the severity of sleep apnea syndrome, cardiac arrhythmias, and autonomic imbalance. Pacing Clin Electrophysiol 26: 669–677. Nakamura T, Chin K, Hosokawa R, Takahashi K, Sumi K, et al. (2004) Corrected QT dispersion and cardiac sympathetic function in patients with obstructive sleep apnea-hypopnea syndrome. Chest 125: 2107–2114. La Rovere MT, Pinna GD, Hohnloser SH, Marcus FI, Mortara A, et al. (2001) Baroreflex sensitivity and heart rate variability in the identification of patients at risk for life-threatening arrhythmias: implications for clinical trials. Circulation 103: 2072–2077. Tkacova R, Rankin F, Fitzgerald FS, Floras JS, Bradley TD (1998) Effects of continuous positive airway pressure on obstructive sleep apnea and left ventricular afterload in patients with heart failure. Circulation 98: 2269–2275. ©2016 Márcio Galindo Kiuchi. This is an open-access article distributed under the terms of the Creative Commons Attribution License, which permits unrestricted use, distribution, and reproduction in any medium, provided the original author and source are credited.